Beth Goetz’s definition of character has served her well so far. From her time as a Clemson soccer player to her current position as chief operating officer of the University of Connecticut’s Division of Athletics, Goetz has become a force to be reckoned with in the world of intercollegiate athletics. Goetz began her experience with college athletics as a soccer player, transferring from Brevard College to Clemson her junior year. Team captain for the women’s soccer team, she went on to earn her degree in psychology in 1996. Grad school and coaching came next. While studying counseling at the University of Missouri-St. Louis, she coached the women’s soccer team to eight winning seasons. It wasn’t long before she became an assistant athletic director and the senior woman administrator for UMSL, setting aside her original plan to be a therapist. However, Goetz explains that her education in counseling and psychology has contributed to her success in athletics. After 12 years at UMSL, she moved on to positions at Butler University and the University of Minnesota, where her responsibilities and leadership gradually increased. 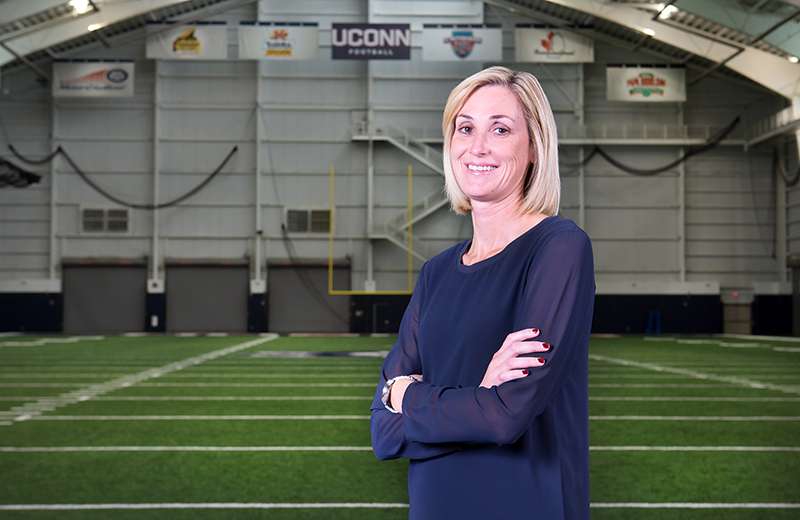 Her current role at UConn has her overseeing day-to-day operations as the sport administrator for football, softball and men’s soccer, Goetz focuses on building a team culture. “Athletics can teach and foster so many important things like commitment and time management, but it’s also about believing you can accomplish more as a team than you can as an individual,” she says. UPDATE: Since we wrote this story, Goetz has moved on to become the director of athletics at Ball State University earlier this year.